Toss together a savory stir-fry, ethnic cuisine, or stew thanks to this Town 34702 14" Mandarin steel wok with a wood handle. The deep curved sides allow for excellent food movement, while the 8 1/2" long handle provides ample room for a sturdy grip. This makes it comfortable for your kitchen staff to hold while preparing hot foods. I have a cast iron wok, but this is my go to now. It is light weight. After seasoning the wok, making dinner healthy takes 10-15mns. The cost of going to flushing or Manhattan chinatowns (parking or metro fees), ordering here is cost efficient (with delivery at your door) for quality products! It pays for itself in one week of you order chinese food often. Got this work because it looks just like my grandmas. Hers lasted a very long time and I'm hoping mine will last awhile. So far so good. Cooks evenly and holds a lot of food. Definitely worth the price! This wok was definitely heavier than I expected. Be careful to wash off all the steel coating; I did not use the wok, as the coating was pretty thick and oily. Not a product for myself, but could work for others. Workhorse of a wok! We love this product and use for multiple items on our menus - very easy to clean and super durable. We will purchase again. The Town 14” Mandarin Carbon Steel Wok with Wood Handle is a great value Wok. It is heavy weight and very durable. The handle is firmly attached and it doesn’t get too hot. It heats evenly and it is long lasting. This 14 inch Mandarin carbon steel wok is great quality and an amazing price. I use my wok pretty often as I love to cook different types of stir frys. I would recommend this! Definitely a great value for the price. It seasoned easily and hold heat well even on a home cook top. The handle is riveted on the wok, that is great as the wok is pretty thick and heavy. Overall, great purchase. I don't like to review items until I've used them for awhile. Well, it's been almost 2 years and I still love this Wok! Once it's broken in, it develops a nice nonstick finish. The Wok heats up really fast, and cleanup is easy with a chain mail scrubber. I thought the handle would be an issue, but I only tightened the handle screws once, hasn't come loose since. A great priced 14" mandarin wok that is great for quick stir fry. We have a few of these are great for cooking orders as they come into the kitchen. I really like this wok! It's the perfect size for my family and it really cooks well. You have to season it regularly but it was super easy and for the price, it's worth it. I got 2 to try them out first at my food business. I like the size and weight. These pas are needed special care and burn them before first use as natural non stick pans. After the initial seasoning the wok was great for use, we have made several dishes including fried rice successfully with this item. I would recommend. It takes some time to season this pan well, and it requires upkeep to prevent rusting. It's large enough to make a couple dishes at once and not as heavy. I've always had a wok at home, they are great for making fast, nutritious stir fries, and noodles This hand hammered wok has a long handle, which keeps you away from the heat as you cook. It is durably made, and the hammered finish makes it easy for cooked veggies to be pulled out of the bowl to cling along the side as you thicken a quick sauce in the bottom, or add another ingredient. This wok is also a good buy and excellent price! Very nice and big wok. It heats up fast and cleans well. The handle is very nice too. It is low maintenance and worth buying. Very basic wok, did the job though.Webstaurant shipped in a timely fashion. Had an issue with order, customer service handled it professionally on the spot. Products were great value for money. Would definitely buy from them again. With the proper amount of seasoning, this wok works like a charm and doesn't stick. Nothing quite like a nice hearty stir fry prepared in it. We have ordered these in the past and this is our first review...Great! The Town 34702 14" Mandarin Carbon Steel Wok with Wood Handle is perfect for cooking on a wok. Love the wok but everything sticks to it. Furthermore it rusts as soon as it touches water. Such a pain to clean too. Would buy non-stick wok's next time. Thanks for the review, Danielle! We're sorry you've had problems with things sticking to your pan. This wok must be seasoned regularly to maintain it's usability. For more information, check out How To Season and Clean a Wok. I really like this wok. It's quite large, so I can cook a lot at once. I haven't had a problem with food getting stuck to it. It's susceptible to rust, so dry it immediately after washing. Great wok for the price, not to heavy, but when loaded up it can be fatiguing of the forearm after an hour of use. Gauge of steel is sufficient to allow rapid heating and cooling and easy temp control. Only ding is the wood handle is screwed in and the metal mount is riveted on. While its held up well so far, the handle will eventually fail. But given the price its a fair tradeoff. This wok is high quality and arrived packaged very well with no damage. 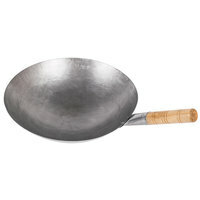 It is clearly hand hammered and has the texture necessary for proper stir frying. The size is very suitable for our family which we wanted .but i think it need to combined with a wok ring as it has a round bottom.i think i will go to buy that one . I like it ! A great starter wok. Not the best construction, but it does the job. Take the time to season it properly and you'll have no issues. It definitely gets better with age. A nice size for home use, especially if you have a gas stove. I prefer the rounded bottom to the flat bottom woks, but you'll definitely need a wok ring (item #88534710) if you don't have a dedicated wok burner. Not great for electric stoves. This is a great wok for families or smaller restaurant portions. I would say it cooks between 2 and 4 servings comfortably. Decent build, if a little thin. Nothing to complain about for the price. We use this Carbon Steel Wok for many Asian dishes, and additionally purchased more for gifts to friends we like it so much. I highly recommend combining this with a wok ring as it has a round bottom. Very nice, much better than using an imitation flat bottom wok. Great "beginner" wok! Works well on an apartment stove, heats up quickly and evenly. After a few uses the natural nonstick film is beginning to form. I look forward to when the wok is fully seasoned and black. I've checked around for a better price, and even figuring in shipping, this is still the best buy. This 14" mandarin w/ wood handle is work good for small restaurant business!!! The Town 14" Mandarin wok with the wooden handle is a nice clean pan and seems to be quality made. The wooden handle will keep a lot of the heat from your hand. I love using woks when I cook. The rounded sides makes it great when sautéing up a stir fry. The metal is very durable and easy to clean. I absolutely love this wok! The website's picture doesn't do it justice, so I've added one for you. I've "seasoned" it and have used it twice (you can see in the photo that it's starting to darken already). Every kitchen should have one and The WEBstaurant Store has it for an unbeatable price! these are great. heat up quickly and produce a nice sear on meats and vegatables. they are easy to clean with minimum scrubbing. remember to dry them after washing. Excellent wok for the home cook. Great for small batches of stir fry dishes. Season it and give it a little care, will last for a long time. Great price! I have used one of these woks in my home for years. The 14" size will adequately cook for 4 - 5 people. You have to season this wok since is is carbon steel. I coated it with a thin layer of lard and heated it on the grill outside at 400 for about 30 min. and it had a nice black patina. you can't go wrong with this item.